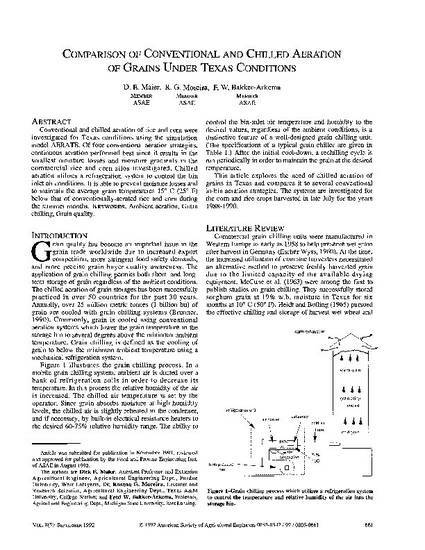 Conventional and chilled aeration of rice and corn were investigated for Texas conditions using the simulation model AERATE. Of four conventional aeration strategies, continuous aeration performed best since it results in the smallest moisture losses and moisture gradients in the commercial rice and corn silos investigated. Chilled aeration utilizes a refrigeration system to control the bin inlet air conditions. It is able to prevent moisture losses and to maintain the average grain temperatures 15° C (25° F) below that of conventionally-aerated rice and corn during the summer months. Copyright 1992 American Society of Agricultural and Biological Engineers. Used with permission.